There is a reason why people relate the fire profession to words like courage, brotherhood, service, and respect. That reason is a clear cut mission and decades of strong leadership. Thirteen Leadership traits that will separate you from the pack. Gain a competitive advantage with promotions. 2. 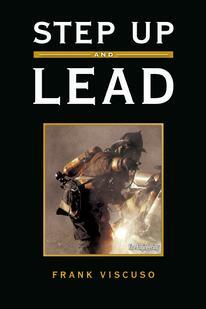 To teach you the secrets of effective leadership from one of the most respected organizations in the world. 3. To help prepare motivated individuals who are serious about advancing their careers and improving their lives. Our country is in need of new generation of leaders. The information contained in this book will help you reach the top of your profession and is considered must read material for anyone who is ready to Step Up and Lead! I receive wonderful messages from people who have read Step Up and Lead on a regular basis. I wanted to share one with you with permission from Roger, who I have become good friends with. Stay Safe buddy, and thank you for Stepping Up and defending our Freedom. My name is SGT Roger Mitchell. I am with the Maryland National Guard, currently deployed in Afghanistan. I am also a volunteer firefighter with the Antietam Fire Company with the city of Hagerstown, Md. I have been taking Leadership classes through the army website, but after those, I had nothing. I work in the OPERATIONS office for a MP Battalion and we are allowed to read as long as it has to deal with military or furthering our career. I also set a goal for myself, take what I learn here and use it at the fire dept. A friend told me about your book, so I bought it and I have to say is...WOW!!! I learned more about leadership from your book then I did in hours of classes. A lot of what you said in the book does pertain to here, and I have been using what I have learned in your book with my soldiers. As a token of thanks for your knowledge, here is a pic of me with your book in Afghanistan. I also bought another copy for a 1st Lt with a US ARMY RESERVE unit. He is also a fireman in Omaha Neb. I hope we can chat sometime. Hope everything is good back home in America.